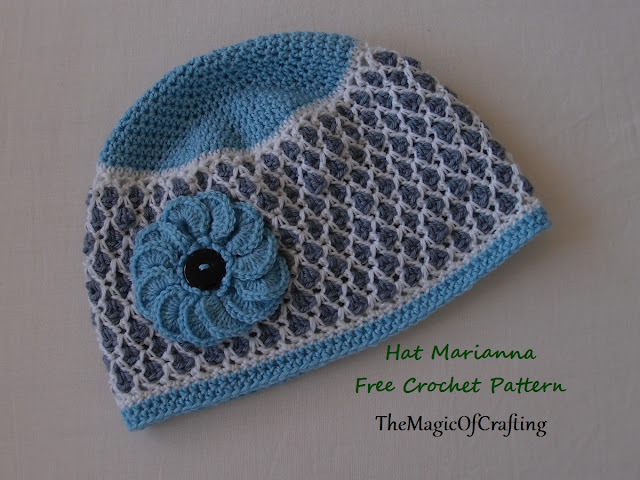 This hat uses same stitches as Hat Arianna but uses different color combination and I have added a flower for nice finishing touch. - The ch 1 in the beginning of the row counts as hdc. 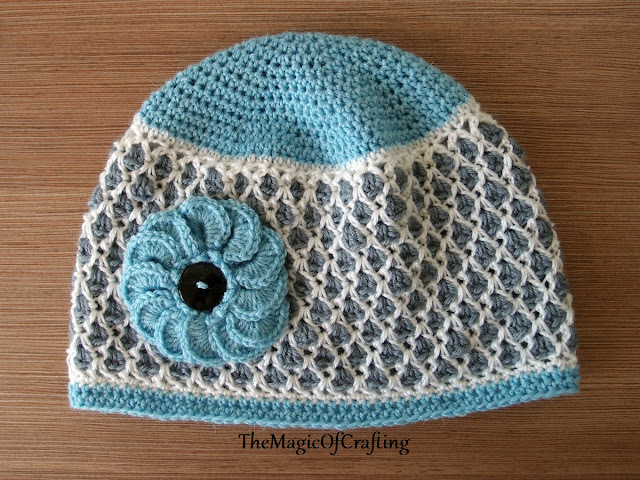 - The crown of the hat is made of hdc stitches. 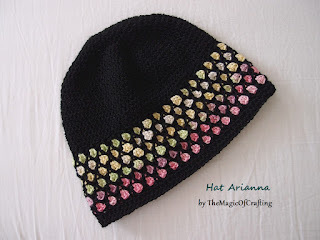 Each row starts with ch1 and hdc in the same st.
- You will need stitch marker for the colored part of the hat. 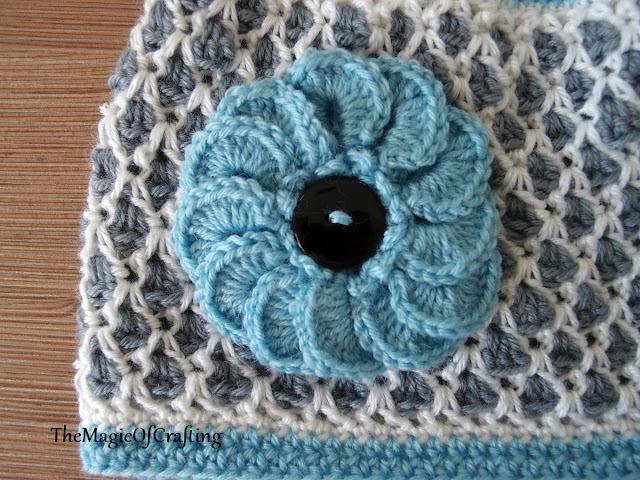 Start with blue colourRound 1: In mc ch1, hdc 7, ss in ch1 (8 st). Round 2: Ch1, 1 hdc in same st, 2 hdc in each st around, ss in top of the chain 1 (16 hdc). Round 3: Ch 1, hdc in same st, hdc in next st, * 2 hdc in next st, hdc in next st* 7 more times, ss in ch 1 (24 hdc). Round 4: Ch 1, hdc in each of next 2 st, *2 hdc in next st, hdc in next 2 st *, repeat * - * till end, finish with ss in ch1 (32 hdc). Round 5: Ch 1, hdc in same st, hdc in next 3 st, * 2 hdc in next st, hdc in next 3 st*, repeat * -* till end, finish with ss in ch 1 (40 hdc). Round 6: Ch 1, hdc in same st, hdc in next 4 st, * 2 hdc in next st, hdc in next 4 st*, repeat * -* till end, finish with ss in ch 1 (48 hdc). Round 7: Ch 1, hdc in same st, hdc in next 5 st, * 2 hdc in next st, hdc in next 5 st*, repeat * -* till end, finish with ss in ch 1 (56 hdc). Round 8: Ch 1, hdc in same st, hdc in next 6 st, * 2 hdc in next st, hdc in next 6 st*, repeat * -* till end, finish with ss inch 1 (64 hdc). Round 9: Ch 1, hdc in same st, hdc in next 7 st, * 2 hdc in next st, hdc in next 7 st*, repeat * -* till end, finish with ss in ch 1 (72 hdc). Round 10: Ch 1, hdc in same st, hdc in next 8 st, * 2 hdc in next st, hdc in next 8 st*, repeat * -* till end, finish with ss in ch 1 (80 hdc). Round 11: Ch 1, hdc in same st, hdc in next 9 st, * 2 hdc in next st, hdc in next 9 st*, repeat * -* till end, finish with ss in ch 1 (88 hdc). Round 12: Ch 1, hdc in same st, hdc in next 10 st, * 2 hdc in next st, hdc in next 10 st*, repeat * -* till end, finish with ss in ch 1 (96 hdc). The circle should measure around 7in (17.5 cm). If you need a bigger size make another 1-2 increasing row with 8 st inc spread evenly. Round 13: Join white. Ch 1, hdc in same st, hdc in each st around, end with ss in the ch 1. Round 14: Ch 4, dc in same st. Skip 2st, * [dc, ch, dc] in the same st, skip 2 st*. Repeat * - * around, end with ss in the top of the starting chain. Put a marker in the last worked st and remove the hook. Round 15 [Grey round]: Join new colour (grey for the pattern) in the ch space between the last two dc from the previous round. Ch 3 (counts as dc), 2 dc in the same st, * work 3dc (cluster) in the next chain space*, repeat * - * till the end. SS in the top of the ch 3 from the start of the round. Put the stitch marker here and remove the hook. Continue the next row with the white yarn. Round 16 [White round]: With the hook draw the white loop (from the last worked white stitch where the marker was) so it is between two clusters of 3 dc from the grey row and ch 4, dc in the same st. Skip the next grey cluster from the previous row, * [dc, ch, dc] between the clusters of 3 dc from the previous row, skip the next cluster *. Repeat * - * till the end of the round, end with ss in the starting chain. Work only in the white stitches from the previous black round. Get the marker from the last worked stitch of the grey row and put it here. Continue next row with the grey yarn. Round 17 [Grey round]: With the hook draw the grey loop from the last worked grey round so it is in the space between 2 dc of the white round. Insert the hook in the grey loop and continue this row with grey. Ch 3, 2 dc in the same space. *Skip to the next chain space and work 3 dc*, repeat * - * till the end of the round, ss in the top of the ch 3 from the start of the row. 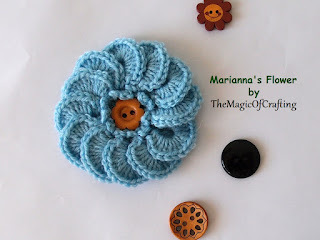 Put the stitch marker here and continue working with white. Round 18, 20, 22, 24, 26, 28, 30, 32: Repeat round 16. Round 19, 21, 23, 25, 27, 29, 31: Repeat round 17. If you need to increase the length continue with few more repeats of round 16 and 17. Round 33: Join blue. Ch 1, hdc in the same st, now work 1 hdc in each st, 1 hdc in the ch space between the dc. You should end up with 96 hdc (or the same number of stitches when you joined white for the first time). Round 34, 35: Ch 1, hdc in the same st, hdc in each st around, ss in ch 1. I make chemo caps and I'm always looking for something cute and different. This makes it on both counts! Thank you. Great cause! I hope your hats bring the patients hope and faith.